John McDonnell has used a personal video message to warn that Labour’s core achievements – such as social housing and the creation of the NHS – which helped his own family are under threat once again from the Tories. 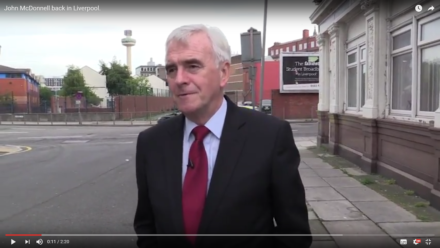 The shadow chancellor published the short film, which shows him returning to his childhood home in a Liverpool inner city street, then among “some of the worst slum conditions in this country”, to highlight how he and his family had been helped by the reforms introduced by Labour governments under Clement Attlee, Harold Wilson and Jim Callaghan. McDonnell says the landmark changes delivered by Labour are “under attack” by the Tories and says Jeremy Corbyn’s agenda can help rebuild so “no community is ever left behind again”. He made the film to mark North West Labour conference, which is being held in Blackpool and runs on Saturday and Sunday. He describes his childhood in bomb-damaged Liverpool and the time spent there before his family moved south as his docker father looked for work. “Everything that Labour governments have done to improve the lives of working people is under attack by successive Tory governments. We shouldn’t have a situation where people are having to go to foodbanks and we shouldn’t have children living in poverty on the scale that we do, even though their parents are in work. I want future generations to have the same chances that I had because in that way not only can you improve the lives of those individual kids, [you] actually improve the lives of our whole community because they’ll contribute something back. McDonnell will be among the speakers in Blackpool alongside shadow education secretary Angela Rayner, shadow housing secretary John Healey and elections and campaigns co-ordinator Jon Trickett. To watch the full video click here.